Welcome to PURPLE EMU, LTD. and PEL BASICS skin care products page. Included in our list of personal care products is our very successful line of professionally designed formulations for difficult skin conditions. We welcome your questions and guarantee your satisfaction with every product we sell. International and domestic orders are processed the same day they are received to insure prompt delivery. To order a product, please click on the "add to cart" button to the right of the product. When you have finished your shopping, click on the "view cart" and then "checkout" button to complete your order. YOUR CREDIT CARD INFORMATION IS ENTERED AND PROCESSED ON A SECURE SERVER. Used by skin care professionals, this highly effective, all natural topical formulation works wonders on both rosacea and acne. Using the synergistic base of Dromaius Oil (emu oil), there is no other topical crème that clears your face as fast or as well. Works great for adult and teen acne. Available in 2 sizes: .5 oz and 2.0 View product details to order larger size. 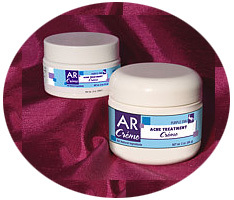 This highly effective, all natural topical crème was created just for rosacea sufferers with dry and sensitive skin. Redness and Blemish Control contains the same ingredients as Blemish Control, however, we've increased the amount of healing oils in order to create a gentler formula. Perfect to control redness and mild acne. Available in 2 sizes: .5 oz and 2 oz. View product details to order larger size. All Natural Moisturizing Cleanser is the ultimate, ultra-gentle cleanser. Made with 100% all natural ingredients, and designed with sensitive skin in mind. This ultra-gentle cleanser was specially formulated for loosening and removing dead skin cells and makeup residue. Enriched with skin-nourishing antioxidant vitamins and natural moisturizing extracts, "Soft as Silk leaves you skin with an amazing softness and fresh feeling like nothing you have used before. Purple Rub is an amazing new pain relief cream excellent for sore muscles, achy joints, sprains and strains, and day-to-day discomforts from sports, chores and all activities. Purple Rub has an enjoyable cooling sensation when applied to the skin with a pleasant, light scent of menthol. Available in 2 sizes: 4 oz and .25 Trial Size View product details to order smaller size and read more about Purple Rub. Introducing…the newest addition to our product line! This remarkable bar soap is specially designed for dry or troubled skin. Many dermatologists recommend not using a commercially produced soap on distressed or problem skin. Handmade emu oil and glycerin based soaps with a delightful fragrance. This bar soap is SLS free and great for your skin. Ideal for bath or shower, this bar soap is a very pretty additional to your decor. Your choice of Sweet Pea or Lavender. Newly formulated! An excellent sun protection to be used for sensitive facial skin, those with troubled skin and gentle enough for babies, too. Ideal for Rosacea sufferers or anyone unable to tolerate the burning associated with drugstore sun lotions that contain chemicals. This newly formulated crème is smoother and creamier for easier application. With its more "whipped" consistency, the tinted color of Protective Sun Crème blends beautifully with most skin types and will give you a healthy look without the pale face usually related to zinc oxide products. A deep penetrating, non-irritating, highly moisturizing, 100% natural nutritional supplement for your skin. Emu oil contains oleic acid which reduces inflammation. Omega 6 and Omega 3, essential fatty acids, are also found in emu oil and are well known to support the nutritional needs of your skin. Available in 7 sizes: 1 oz, 2 oz, 4 oz, 8 oz, 1 pint, 1 quart and 1 gallon. View product details for larger sizes. Moisturizes and softens the skin, deep penetrating for dry and chapped skin. Great for working hands. Also available Fragrance Free - see Product Details to order. A highly effective, odorless, roll-on analgesic pain reliever. Perfect for muscle aches. Deep heating, works fast. A special cleansing formula containing emu oil that softens, adds body and will leave your hair luxurious. An odorless topical aid that reduces itching, scaling and redness associated with Psoriasis. Formulated with the patent Ultra Emu Oil ®, our Emu Oil Gel Caps contain the highest concentration of essential fatty acids you can find. Pure emu oil contains a complete balance of the essential fatty acids (Omega 3, Omega 6, and Omega 9) that are nearly identical to the fat profile of the human body. Consumption of these polyunsaturated (Omega 3) and monounsaturated (Omega 6 and Omega 9) fats can improve the body's operations for people whose modern diets lack proper balance of essential fatty acids. This specially formulated, all natural Lip Moisturizer uses pure AEA Certified Emu Oil to create our Lip Moisturizer which softens and protects dry chapped lips. Unique wound and burn care formulation derived from all natural ingredients that have been combined with the remarkable transdermal effects of emu oil. Excellent aid for bedsores and other hard to heal wounds.